The Philippines is a Southeast Asian country in the Western Pacific, comprising more than 7,000 islands. Its capital, Manila, is famous for its waterfront promenade and centuries-old Chinatown, Binondo. Intramuros, a walled city in colonial times, is the heart of Old Manila. It’s home to the baroque 17th-century San Agustin Church as well as Fort Santiago, a storied and military prison. You will be welcomed upon arrival and transferred to your hotel in Manila by our 's representative. Overnight at the hotel. After breakfast at the hotel, proceed with the tour to Pagsanjan. Pagsanjan Falls is one of the most Famous waterfalls in the Philippines. Located in the province of Laguna, the falls is one of the major tourist attractions in the region. The falls are reached by a river trip on dugout canoe, known locally as shooting the rapids, originating from the municipality of Pagsanjan. Overnight at the hotel. After breakfast at the hotel; check-out and proceed to your Manila City Tour. The interesting highlights are Fort Santiago, built in 1663 inside the older Walled City of Intramuros (1591 – 1593). The Rizal Park and rolling tour to the reclaimed area of the Cultural Center Complex; then to the Central Business District of Makati. A visit to a curio of Filipino crafts is a must for a change in your shopping environment before driving back to the hotel. Have lunch at the local restaurant before you transfer-out for your domestic flight going to Boracay. The palm-studded Island of Boracay – with its white, talcum-fine beach, balmy weather, and warm, crystalline waters – is like a hypnotic magnet. The best part of the island is the 4-kilometer white beach hailed as the “finest beach in the World”. Overnight at the resort. 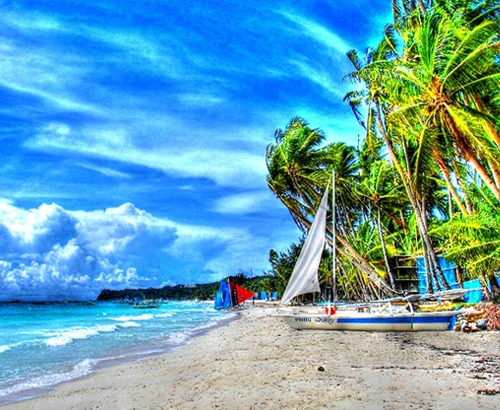 Have breakfast in the resort and proceed with your Island Hopping Tour; it is one of the must-do activities in Boracay. A 4-hour boat tour around Boracay beaches (Ilig-iligan Beach & Puka Beach) in an outrigger boat/banca, snorkeling at Tulubhan and Tambisaan Reef, visit the Crocodile Island, Crystal Cove Island and explore the two caves and beautiful scenery and relax on the hut/cottages. Have lunch before going back. Overnight at the resort. Breakfast at the hotel. Check-out at 12:00 noon. You will be transferred back to the airport for your flight-out of Boracay After breakfast at the hotel; check-out and transfer-out for your domestic flight going to Cebu. Cebu, the “Queen City of the South”, the second most significant metropolitan centre in the Philippines and is also known as the oldest city established by the Spaniards in the country. Cebu is known for its sumptuous food and delicacies as well as its vibrant beaches and nature activities. Overnight at the hotel. Have breakfast and proceed with your Cebu City Tour – Discover the charm of old Cebu in major landmarks; Fort San Pedro, Magellan Cross, Basilica Minore of the Child Jesus, the tour proceeds down the South Road properties and continue to uptown passing by the city's major universities & schools. Next stop will be on Taoist Temple on a scenic hillside in Beverly Hills. The tour moves to Asiatown IT Park & ends in Ayala Business Park. Overnight at the resort.